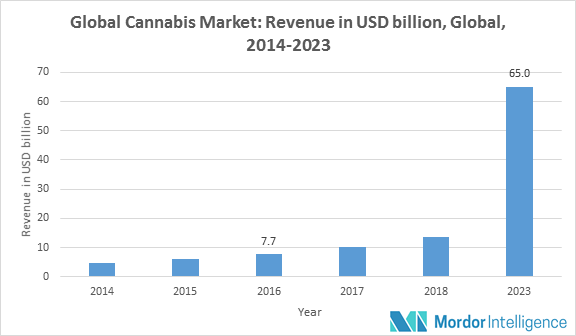 The global cannabis market was valued at USD 7.7 billion in the year 2016 and is expected to reach 65 billion by the year 2023 while registering a healthy CAGR of 37% during the forecast period. The growth rate can be attributed to the fact that various countries are now legalizing the usage of cannabis for medical purposes and various states in US are legalizing the usage of cannabis for recreational purposes as well. North America accounts for more than 95% of the global cannabis market, with US alone making up more than 90% of the North American, as well as global market. Peru was the most recent addition to the list of countries which have legalized the usage of Cannabis for medical purposes. Vermont was the latest addition to the list of US states where cannabis is legal for medicinal usage. Canada is expected to follow the steps of Uruguay and attain complete legalization of cannabis, so that it can be used for both medical, as well as recreational purpose. Countries, like Spain, Netherlands, and Italy are also expected to legalize the usage of cannabis for medical purposes, in the near future. Companies involved in production and trade of cannabis and cannabis-based products are focusing on standardizing their products, as well as getting intellectual property rights for their products. Genetic advances in cannabis research is also expected to change the dynamics of the current cannabis market. The need to create consumer friendly products and to define their brand companies are looking to patent their products to create a unique consumer base. Global Cannabis market is experiencing a staggering growth due to legalization of cannabis for medicinal purposes and increasing acceptance of these products. December 2017: Health Canada provided licenses to two Quebec based cannabis production facilities. November 2017: Ohio Department of Commerce provided 12 provisional large-scale medical cannabis cultivation licenses.